Take a look at this excellent short piece of film featuring the boat yard. Filmed using a drone it gives you a great view of our facilities. Ardmaleish Boatbuilding Company, established for many years in the pleasure craft market as a family run business, is making a name in the industrial market with servicing and repairs. 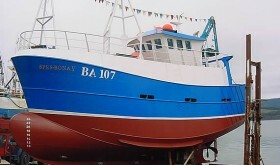 We can work on all types of commercial craft from fishing boats to ferries, in steel or wood. In fact it is a testament to the reliability and competitiveness of the company that the yard is now in its 20th year of servicing Caledonian MacBrayne's extensive fleet. In addition to repair and maintenance work, Ardmaleish Boatbuilding are fully equipped to take on new-build contracts. SLIPPING FACILITIES 3 slips capable of taking vessels up to 500 tons. COVERED SHEDS Capable of covering vessels up to 240' long with 46' headroom. CRANAGE 1 X 30 tons, 1 x 25 tons and 1 x 12 tons, all mobile.